Book your therapeutic massage or skincare session now. Bask in an atmosphere of tranquility and healing and rejuvenate your life! The finest and highest quality alternative healing therapies, Reiki, life coaching, therapeutic massage and skincare you will find anywhere. We are committed to listening to your needs and preferences and will tailor every session to your needs on that day, and we know how that can change from day to day! 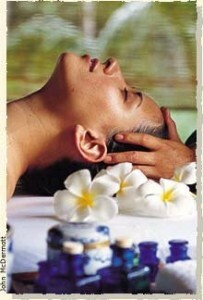 Let yourself be pampered and taken care of and go back out into the day with a renewed sense of vitality. We incorporate essential oil aromatherapy, ice, heat, the synergy stone technique, and strive to make each visit your best experience. Specializing in therapeutic sports massage, deep tissue massage, trigger point, sports stretching , migraine headache relief , Reiki healing and our newest treatment…….. THE SYNERGY HOT STONE TREATMENT-This technique will absolutely bring you to another level of stress relief and relaxation!! Literally melts away the knots and soothes the most stubborn areas of tension in one session! With the use of heat and ice, your body responds with reduced inflammation and increased blood flow to the areas of extreme tension to relax and soothe. This can be incorporated into any other massage session as well. We also offer skincare and eyebrow services as well as a full line of gluten free and 100% natural essential oil serums. Our signature serums are a blend of 100% organic essential oils with no added ANYTHING! Pure plant essence for the health of your skin and body. We now offer Regenerative Medicine, acupuncture , please call for an appointment! Mobile Service Areas: Newport Beach, Newport Coast, Laguna Beach, Corona del Mar, Irvine and surrounding areas.